Throughout the day on Sunday, April 23rd, members of FUMCR will form assembly lines in the Bartula Family Life Center gym at church. We'll seal dried veggies, soy, and rice into packages for delivery to children and adults around the world. 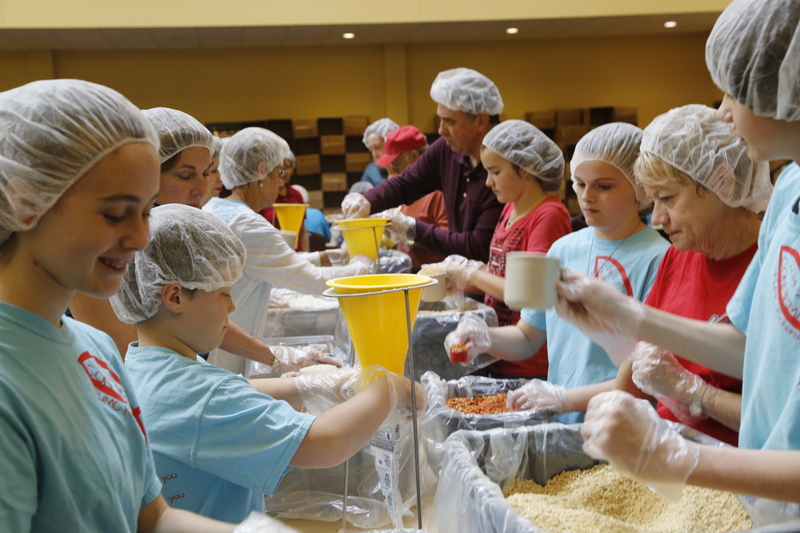 The organization Stop Hunger Now has helped us do this for several years and always does a great job of involving everyone from kids to seniors at all levels of physical ability. The food itself costs about $30,000, so we need financial support to purchase the food and volunteer support to assemble the meals. My family has participated every year we've done this. It's fun, makes a huge impact on people's lives, and if you've ever wished you had more selfies while wearing a hair net, this is your chance! I hope you'll join us. I also hope you'll join us for Access worship this Sunday at 11:00. We'll take a break from the craziness of life to re-center on God, worshipping with music, giving, prayer, scripture, and a sermon that looks at the "Holy Ground" of decision. Don't forget to invite friends and neighbors to come with you too! Very Great Article. I love cup cakes. it is a wonderful information and also get good knowledge and ideas from this article. The author is giving good thoughts and suggestions to each and every readers through this article. Thanks for sharing nice article.